You are viewing the archived 2016 ratings for Car Servicing Go to the current Car Servicing ratings. Canstar Blue research finalised October 2016 and published October 2016. Oil Changers doesn’t look to be slowing down, once again rating five stars in overall satisfaction, receiving its fourth consecutive award for car servicing satisfaction. Stop and think for a moment, could you manage without your car? For many of us, the answer to that is a straight ‘no’. A car is one of the most important assets many of us own, so it is really in your best interests to ensure it is properly cared for. You should service your car every 12 months, or as often as your car manufacturer requires. While a car service may leave you a hundred or so dollars out of pocket upfront, 69% of car servicing customers we surveyed as part of our most recent study believe regular car services save you money in the long run. In contrast, 23% of survey respondents said they are getting their car serviced less regularly to save money. More alarmingly, 15% say they will only get their car fixed when it fails its warrant of fitness! For many of us, our knowledge of cars extends about as far as knowing where to put the fuel. That means, when we get our vehicles serviced, we’re going in pretty blind and we have to trust the mechanic’s advice. According to our research, 18% say they have no idea if their car actually needs the repairs or maintenance they pay for. Further, 8% say they have been asked to pay for work they didn’t request when they arrived to collect their car. Of course, this isn’t a problem if you go to a reputable car servicing chain – but who fits the bill? 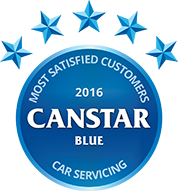 Canstar Blue has annually reviewed car servicing chains since 2013, canvassing the opinions of customers across key criteria. In this year’s ratings, we asked men and women who had their car serviced by a chain in the last two years how they rate their experience in terms of value for money, cost of parts, time taken, warranty of repairs, effectiveness of repairs, customer service, advice and overall satisfaction. The results for 2016 saw Oil Changers take its fourth consecutive award for car servicing satisfaction. Even more impressively, this is the third time Oil changers has received a perfect five star rating across all satisfaction criteria, making it not only a loved car servicer, but one of the most loved brands in general that we have rated. As we mentioned, Oil Changers has proven itself a champion of car servicing since 2013, again rating five stars in overall satisfaction. The company’s website lists a wide range of services it offers with the price of its full services starting at just $79.95 – considerably lower than the advertised prices for similar services by its competitors. On top of its other services, Oil Changers also offers free checks & top ups to eligible customers. AA Auto Centre offers up to four levels of car servicing ranging from bronze to platinum – platinum being the most comprehensive package. Prices begin at $179 ($159 for members) for its non-European petrol car bronze servicing deal. AA Auto Centre has improved its performance in the past year, rating four stars in overall satisfaction. The Midas website lists its range of products which include basic service, smart service, premium service, diesel service, euro service and logbook service. Midas says prices for its basic service begin at $139.95. Midas was rated a commendable three stars in overall satisfaction. Pit Stop’s website advertises five services: Express, extensive, elite, eurocar and Diesel, vans & 4 x 4. The express package is the cheapest and most basic deal for non-European petrol cars and includes a 15-point check for $139. Pit Stop also rated three stars in overall satisfaction. Canstar Blue commissioned I-view to survey 2,500 New Zealand consumers across a range of categories to measure and track customer satisfaction. The outcomes reported are the results from customers who have had their car serviced by a car servicing chain in the last two years – in this case, 415 New Zealanders.